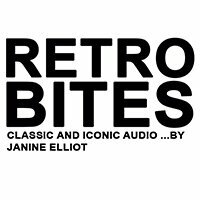 Janine Elliot continues her fascinating RetroBites series, this time focusing on reel to reel and cassette tapes and in particular the British brands NEAL and Ferrograph. As we now begin to see reel to reel tapes becoming (very slightly) fashionable as we get over throwing away our vinyl (luckily I never stopped playing mine), one wonders if top-end cassettes will ever make it back, if the price of Nakamichi Dragon wannabees get to saleable prices. 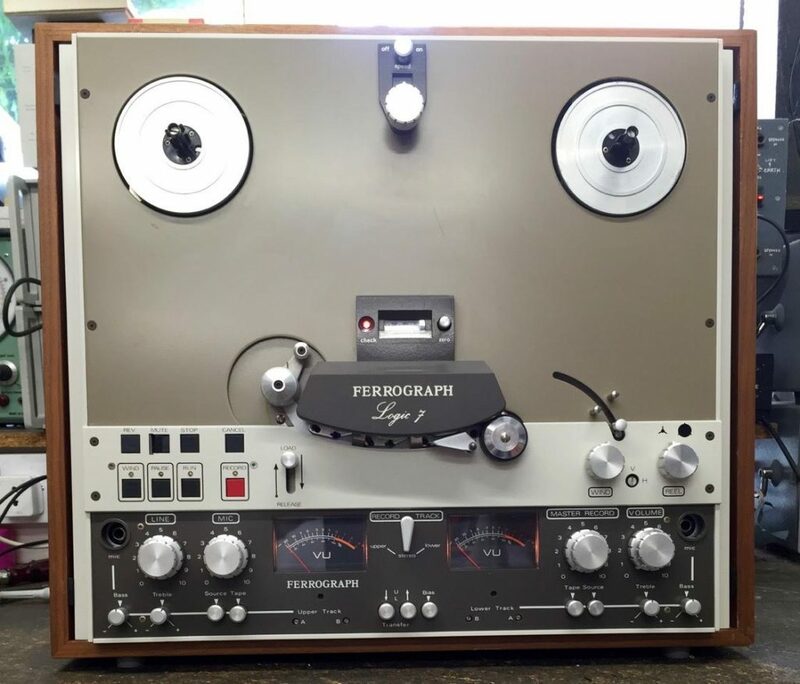 As I start up my aged Ferrograph Logic 7 reel to reel, it being created as UK competition for the Studer/Revox and Tandberg pro and semi-pro market-leaders, my mind thinks of NEAL, (North East Audio Ltd) a UK cassette recorder company set up to compete in the top end consumer market led by Revox/Studer, Tandberg, Uher, and of course Nakamichi. As a child buying my first cassette deck, a beautiful looking top loading Akai GXC-310D, I wondered why anyone would ever want to purchase an industrial looking NEAL, despite being very patriotic and wishing to fly the home flag. Like most children and adults alike, beauty on the outside was of prime importance in any purchase. Akai was already a market leader of tape products, producing good looking and very able machines with good motors and life-lasting glass and crystal ferrite heads. It, and 2 other Akai cassette decks in my collection, still work 40 years later. The Neal was in another world. With buttons designed to be thumped and the whole designed to be worked constantly and, in the case of their police interview recorders, probably by those who weren’t hi-fi addicts, it perhaps wouldn’t be a good starting point for any company trying to make it big. They weren’t alone; Tandberg cassette decks were similarly less beautiful than Japanese alternatives, but behind the facia was a beautiful engine, and as a child I compared the two (especially Neal 310 and Tandberg TCD310, both coincidentally with the same numbers). I hoped one day for the Tandberg, without giving a thought to the NEAL, which is a great shame; they are very sought after and rare to find. Alas in much of the 1970’s Britain there were brilliant ideas but largely with a disastrous end product; think of the Austin Princess reliability or MG Maestro Turbo build quality, need I go on. Both cars had world beating ideas. The former was the first car with concealed windscreen wipers, had a unique wedge shape and an annoying red seat belt warning light, and was probably the most adventurous ever car from the conservative BL drawing boards. The MG Maestro Turbo was 15mph faster than a Golf GTI and had a computer voice to annoy you, well, the voice of actress Nicolette McKenzie actually. Both could have made Brits proud. They didn’t. The NEAL and Ferrograph machines had decaying pinch rollers eventually ending up as a sticky soup and noisy knobs and faders, and neither ergonomically inspiring. The ‘guts’ of the NEAL, however, were built like a tank and if you still have one it probably works. Made in Newcastle the 102 started it all off, with the company setting its sights on the top end market, not least because UK building and salary costs meant it couldn’t compete with the lower end of the market. The first machine even ended up rebadged as various Wollensak and an Advent “201”. This machine came with a plastic cover, which was just as well as this top loading machine didn’t have a cassette door for the cassette compartment. Whilst it came complete with Dolby B noise reduction the controls were all very strange; a centrally positioned forward wind/reverse lever that you turned right or left respectively to move the tape where you wanted to send it (which it did very quickly! ), a pause control that you could pull up to momentarily pause the playback or record, or that you could latch to the right to pause it whilst you go off to make boil the kettle. There is an eject button, though there isn’t much point as you can simply grab the tape to remove it. The whole is built like a BSR reel to reel tape recorder, with massive AC motor and idler design, noisy and built to last for ever. The similar looking 103 followed in 1975, luckily to later be totally replaced by more professional looking and more modern upright players be seen in these very industrial designs, such as the solenoid controlled 301/312HX/320 models. 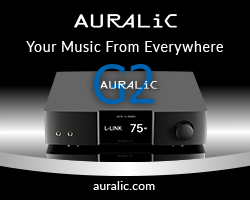 With big buttons and Peak VU meters it was obvious that this was designed to last. Sporting 3 heads, 3 motors, logic control and built in 500Hz calibration oscillators these were designed for the serious audiophile, and later NEAL becoming a common name in police interview rooms, recording the words of possible criminals across the land. Chosen because they were British and very industrial build. The days when police cars were Rover SD1’s and bikes were Nortons, rather than Skodas, Mercedes and BMWs. The reference to Ferrograph in the previous paragraphs is intentional. Ferrograph had already been absorbed in 1959 by the Wilmot Breeden Group, a company set up in the 1920’s in Camden street, Birmingham, famed for supplying bumpers to Standard cars by the 1950’s and later to almost all British car manufacturers. With their sales falling even further in 1977 meaning heavy financial losses for the company, in order to safeguard jobs the National Enterprise Board arranged the joining of Ferrograph with NEAL. Actually both companies were linked from the very beginning; NEAL was in fact formed by ex-Ferrograph engineers to make high quality Compact Cassette recorders after having proposals for making Ferrograph ‘labelled’ cassette recorders was rejected by the management. Therefore many 300 series machines are labelled as either ‘NEAL’ or ‘NEAL Ferrograph’. Wilmot Breeden then sold the Ferrograph company for £550,000. Consequently NEAL took on the production of the whole product range except for a few items. In 1981 the company passed into the hands of the receiver, to be raised again from the ashes in 1996 by the Canford Group, who now make interview recording equipment for PC Plods, including triple (yes triple) CD recorders and even a cassette player, and even selling cassette tapes. But whilst sales of cassette tapes to the few might be continuing the format is sadly almost dead. However, there are a few signs of life still with the medium, and perhaps the days of meticulously putting together a tape of love songs for your partner might return, since the methodical copying and ripping of mp3’s is highly unromantic. As new reel to reel tapes come on to audiophile market in recent years, there are actually a few cassette companies producing music-cassettes, and looking at their figures, quite profitably. American company NAC (National Audio Company) sold more than 10 million audio cassettes in 2014, and companies such as American ‘Sanity Muffin’ are making “music cassettes” again. The Concise Oxford English Dictionary might have removed the term “cassette tape” in 2011 (oh, and Ferrograph were the first company to use the phrase “Take Deck”), but in police interview rooms at least, it lives on. In 2011 it was estimated that 200,000 tapes were used by each of the 43 county police forces in the UK on their NEAL machines. That’s a lot of cassettes. So, why is that the case? Quite simply it is the fact that editing in this format is never going to be successful, despite my many attempts with an 1/8th inch editing block and razor blade in the 70’s. You see, the police need to ensure that they cannot be accused of editing the truth, and whilst digital formats can be tailored to your needs, that cannot be said for the humble Philips cassette. Another reason for the format’s long life is that the cost of replacing the aged NEAL 5000, 7000 and 9000 series would be huge and wouldn’t please UK tax payers. The introduction of physical recording in police interview rooms only actually came into existence in 1988, but wasn’t until 1991 that it became standard practice; the very same year that the mp3 format we so loathe came of age. Whilst NEAL under Canford Audio ownership has moved ahead with triple-CD recorders, most police forces are still content with the cassette format and unlikely to erase it from their stations in the immediate future. Consequently NEAL still manufacture and maintain the analogue format, producing as they do a single cassette playback unit, looking more like an aged cash register, though sporting a fine three motor transport. The link between this model and the original NEAL marque is, however, quite simply the cassette that both use; the two companies are totally different entities. The NEAL that I wished in later life that I had got to know as a child only exists in visits to eBay. Such a shame that Canford no longer make a cassette recorder, because Marantz still do; the PMD-300CP. 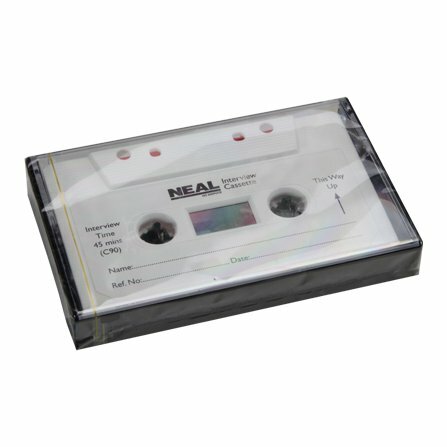 Going by the renaissance of vinyl, and hopefully soon reel to reel tapes, perhaps NEAL shouldn’t pause or stop, but fast forward to producing a cassette recorder like their 502 so that we all get out our cassette tapes that have been hidden at the back of our wardrobes since the 80’s. What caused the demise of the format to lowly MP3 was partly due to the bad reputation of the cassette, and much of that was actually our own silly fault. Those bad quality jammed cassettes were due to us buying cheap high street branded tapes rather than more expensive Maxell, TDK and Fuji models. Boots and Woolworths tapes were not built to be placed anywhere near a Nakamichi, or NEAL for that matter. Whilst the vinyl record ‘revolution’ might sound big it actually only represents 3% of the music business. Perhaps if reel to reel and even cassette tapes were to return then we really could say that there actually really was an analogue renaissance. Now, where is my Neal Sedaka cassette tape?